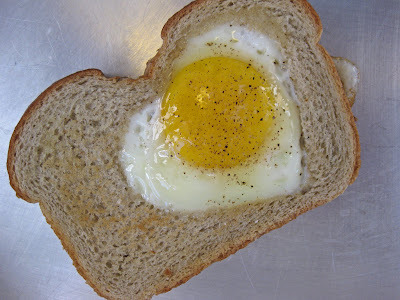 this is my take on eggs in a hole. you can get a recipe anywhere, she has a good one here (but a bit different in preparation). i’m not going to write a full recipe as this is pretty simple and my to-do list is quite long today. yikes! first things first, you need a hole in a piece of bread of your choice. this is wheat. yum. 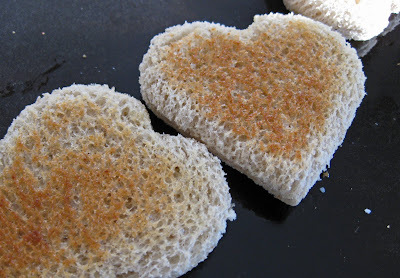 i used a heart cookie cutter this time, but often just use the rim of a glass to create a circle. then use melted butter to butter your toast and the shape you removed (both sides folks). place buttered bread on griddle or pan and brown one side. 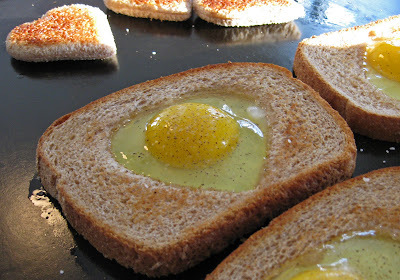 flip and crack an egg into the hole. salt and pepper. cook until the egg is pretty well set, but not burnt. the top will still be runny and wet. transfer to a cookie sheet and place in your oven set to broil. watch carefully until the egg is set to your liking. don’t walk away because your toast and egg will burn. trust me. fun right? i don’t do fried eggs… so this is a perfect alternative. maybe you can surprise your significant other with a special treat tomorrow morning. fry some bacon and brew some coffee and your done!